WASHINGTON -- South Korea and the United States will hold their annual defense ministers' talks in Washington this week over a range of bilateral issues, such as the transfer of wartime operational control, Seoul officials said Monday. 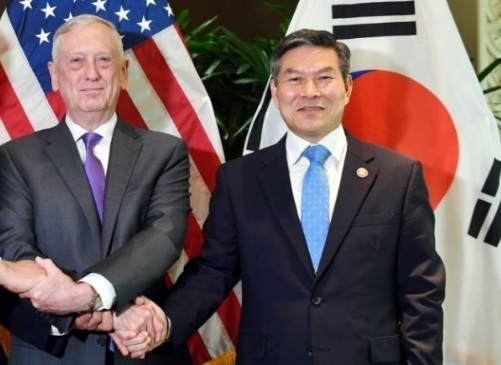 Defense Minister Jeong Kyeong-doo and his US counterpart, James Mattis, will attend the 50th Security Consultative Meeting on Wednesday as the allies seek to stay on the same page to achieve the final, fully verified denuclearization of North Korea. Seoul and Washington are expected to reach an agreement on a new composition of their combined command, which will come after the "conditions-based" OPCON transfer. With the composition, a South Korean general will lead the combined forces. Seoul was supposed to regain wartime OPCON in 2015, but the transfer was postponed as the allies agreed in 2014 to a conditions-based handover in the wake of Pyongyang's continued nuclear and missile provocations. As the two sides push for the transfer, they are expected to speed up their work to verify South Korea's capability to lead combined forces. The allies will first verify Seoul's initial operational capability, then its full operational capability and full mission capability. At the SCM, the two sides are also expected to coordinate over the proposal to suspend their annual massive Vigilant Ace air exercise that involved some 270 aircraft last year in a show of force against a then provocative Pyongyang. The US Department of Defense has said that the allies agreed to suspend the exercise. But Seoul's defense ministry said the allies just weighed "various ideas, including the (suspension)" in an apparent indication of differences over the fate of this year's exercise. At the SCM meeting, Jeong and Mattis are likely to discuss cooperation in enforcing the September inter-Korean military agreement aimed at reducing tensions and preventing accidental clashes. Reports have said that Washington may feel uneasy over the fast pace of inter-Korean military cooperation when Pyongyang has yet to take concrete denuclearization steps.